Tina Knowles reveals how Beyoncé saved the day after Solange broke out in HIVES before wedding! Tina Knowles says there “wasn’t a dry eye” at daughter Solange’s wedding. Beyoncé’s 28-year-old sister married her music video director love Alan Ferguson on November 16 in New Orleans, Louisiana. And their mother admits it was an emotional event for all. "There wasn't a dry eye in the place," Tina gushed to Entertainment Tonight of the ceremony. "They were just so heartfelt and I just think the wedding epitomised Solange as a person, and her and Alan's artistic flare." 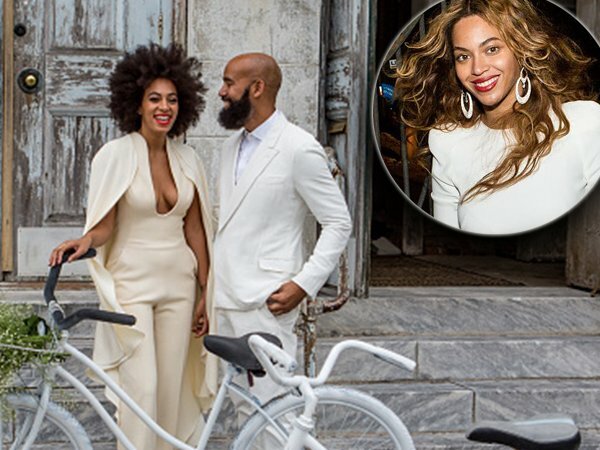 The wedding was visually stunning, with everyone in attendance dressed in all-white. However, there was one glitch that Solange tweeted about herself on the day: she got hives. "[Solange] went through the wedding and the sit-down dinner and she was just fine, and then they had a second line in the streets of New Orleans and she was dancing so hard, I think she just go overheated," Tina explained, of the welts on her daughter’s face and neck. "And the seafood, I think she had a reaction to it." And apparently it was her big sister Beyoncé who took care of her. Tina told the entertainment show her younger daughter was soon feeling well enough to return to her big day, just in time for the reception. "[Beyoncé] took her back to the hotel and gave her Benadryl and cortisone creams. She took a shower and in two hours, she showed up at the reception and did the dance with her son and just had a ball," said the girls’ mother. Solange brought ten-year-old-son Julez along to part of the reception. But Tina says the after party was past bedtime for Beyoncé and Jay Z’s three-year-old daughter Blue Ivy, so she had to skip it out. "She didn’t get to come to the after party," Tina said of Beyoncé’s little girl. "[Julez] only got to come and do the dance and then he had to leave. Had to go to bed. It was a grown folks party." With all this talk about weddings and children, Tina admits she loves being a grandmother. She’d also like for her girls to have even more kids. "I got two boys and a girl. Couldn't ask for better than that," she said. "I'm always ready for more grandbabies."